Abstract. Spectral radiance measurements collected in nadir and sideward viewing directions by two airborne passive solar remote sensing instruments, the Spectral Modular Airborne Radiation measurement sysTem (SMART) and the Differential Optical Absorption Spectrometer (mini-DOAS), are used to compare the remote sensing results of cirrus optical thickness τ. The comparison is based on a sensitivity study using radiative transfer simulations (RTS) and on data obtained during three airborne field campaigns: the North Atlantic Rainfall VALidation (NARVAL) mission, the Mid-Latitude Cirrus Experiment (ML-CIRRUS) and the Aerosol, Cloud, Precipitation, and Radiation Interactions and Dynamics of Convective Cloud Systems (ACRIDICON) campaign. Radiative transfer simulations are used to quantify the sensitivity of measured upward radiance I with respect to τ, ice crystal effective radius reff, viewing angle of the sensor θV, spectral surface albedo α, and ice crystal shape. From the calculations it is concluded that sideward viewing measurements are generally better suited than radiance data from the nadir direction to retrieve τ of optically thin cirrus, especially at wavelengths larger than λ =  900 nm. Using sideward instead of nadir-directed spectral radiance measurements significantly improves the sensitivity and accuracy in retrieving τ, in particular for optically thin cirrus of τ ≤ 2. 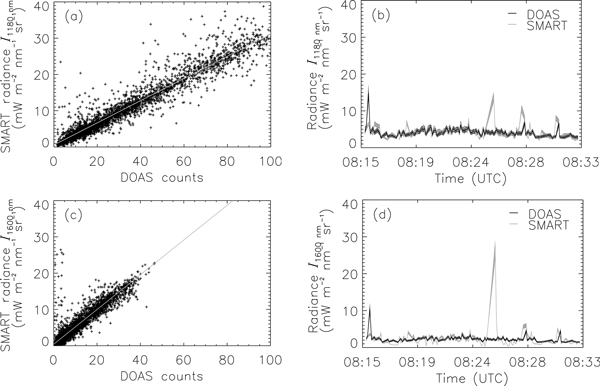 The comparison of retrievals of τ based on nadir and sideward viewing radiance measurements from SMART, mini-DOAS and independent estimates of τ from an additional active remote sensing instrument, the Water Vapor Lidar Experiment in Space (WALES), shows general agreement within the range of measurement uncertainties. For the selected example a mean τ of 0.54 ± 0.2 is derived from SMART, and 0.49 ± 0.2 by mini-DOAS nadir channels, while WALES obtained a mean value of τ =  0.32 ± 0.02 at 532 nm wavelength, respectively. The mean of τ derived from the sideward viewing mini-DOAS channels is 0.26 ± 0.2. 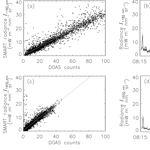 For the few simultaneous measurements, the mini-DOAS sideward channel measurements systematically underestimate (−17.6 %) the nadir observations from SMART and mini-DOAS. The agreement between mini-DOAS sideward viewing channels and WALES is better, showing the advantage of using sideward viewing measurements for cloud remote sensing for τ ≤ 1. Therefore, we suggest sideward viewing measurements for retrievals of τ of thin cirrus because of the significantly enhanced capability of sideward viewing compared to nadir measurements. How to cite: Wolf, K., Ehrlich, A., Hüneke, T., Pfeilsticker, K., Werner, F., Wirth, M., and Wendisch, M.: Potential of remote sensing of cirrus optical thickness by airborne spectral radiance measurements at different sideward viewing angles, Atmos. Chem. Phys., 17, 4283-4303, https://doi.org/10.5194/acp-17-4283-2017, 2017. The potential of airborne radiance measurements in the sideward and nadir directions for cirrus remote sensing is investigated. Therefore radiative transfer simulations were used and the sensitivity of upward radiance with respect to optical thickness, effective radius, surface albedo, wavelength and viewing angle was studied. It was shown that sideward observations lead to more accurate retrieval results. Investigating a case study of ML-CIRRUS, these findings are confirmed.